With summer gas prices unusually low, there’s never been a better time to get out on the open road. Enjoy the freedom of a hassle-free road trip by booking the perfect rental car when rates are lowest. As always, our Travel Hacker Data is here to help, with recommendations for when to book and where to go. 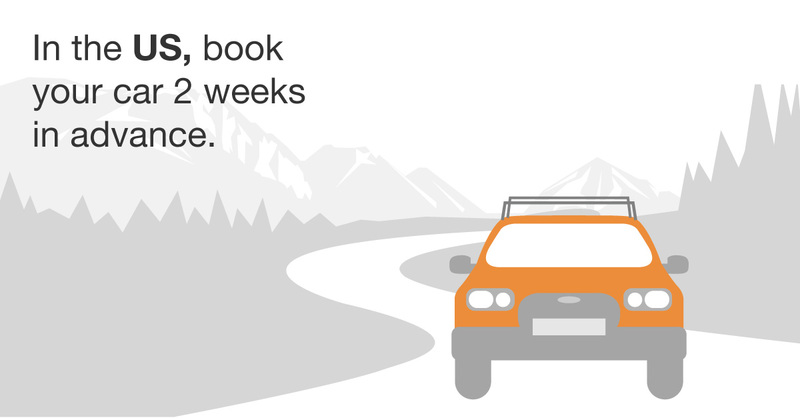 If you’re planning a trip within the U.S., our data shows that in general, the best time to book your rental car is 2 weeks before your trip. And for those wondering where to start their journey, we’ve outlined 10 popular road trip origins in the U.S. and paired each with road tripping tips and the ideal booking windows. So get your playlist ready, pack a few extra snacks, and let us help you make the best travel decisions this summer. 3 weeks out (or a little more) is the perfect time to book your car for some southern sightseeing. Fill up your tank and explore one of the charming southern cities nearby, including Nashville, Charlotte, and Savannah. With beautiful Burlington, Vermont just a short drive away and over 100 institutions in the Greater Boston Area, now’s the perfect time to get a jump start on those college tours. 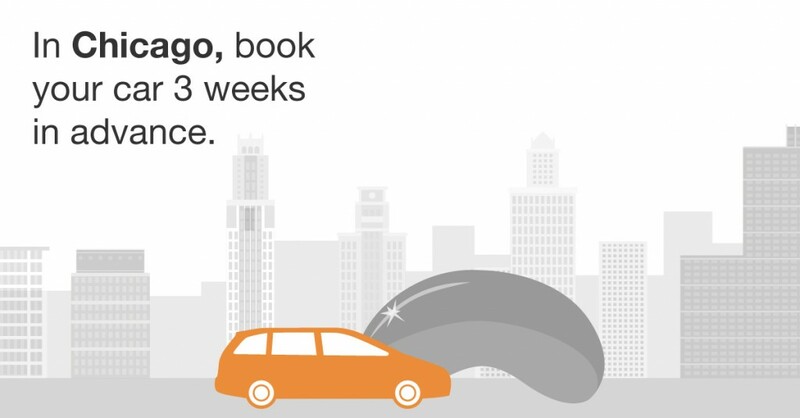 The lowest rental car rates can be found about 3 weeks before your trip, but if you’ve already missed that mark, don’t worry – prices fall again when your trip is 10 (or fewer) days away. In the Windy City, the best time to book is between 2 and 3 weeks before your trip. And with Kohler, Wisconsin just a 2.5 hour drive away, there’s no excuse not to get your golf on at the golf championships this August. 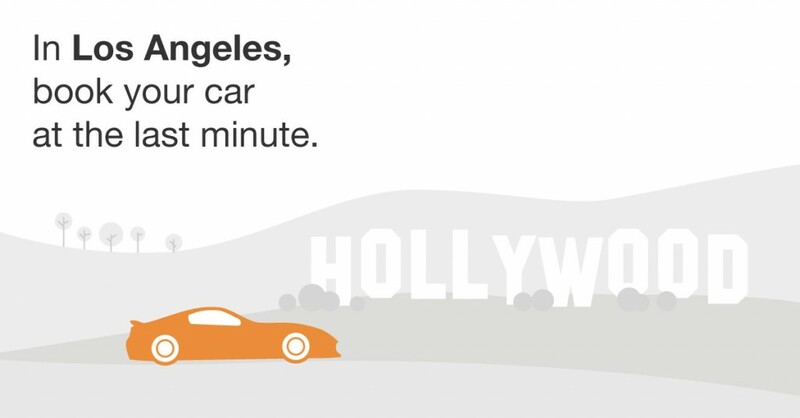 If you’re starting your road trip in the City of Angels, waiting won’t hurt you (or your wallet). 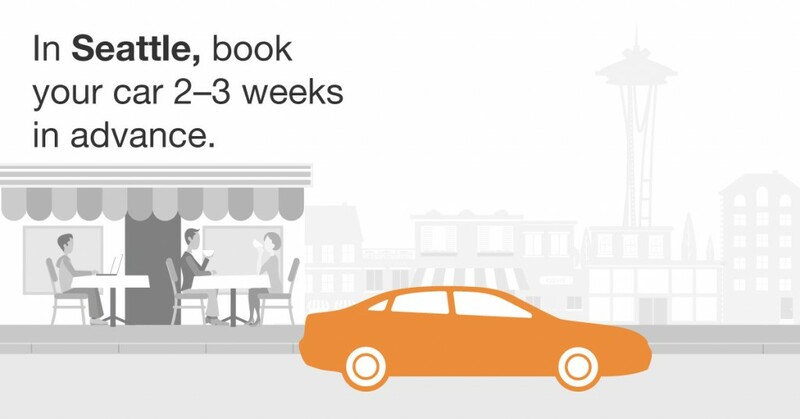 When it comes to booking rental cars, the closer to your date, the better. Wondering where to go? Laguna Beach is a quick drive away and offers great hiking trails and some unforgettable ocean views. 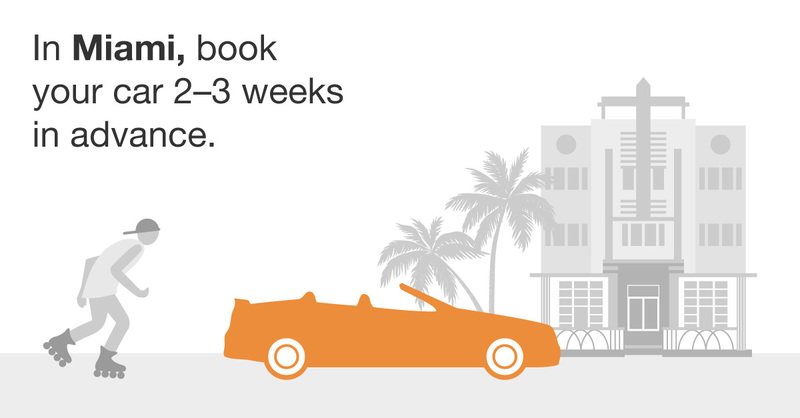 You should book your car about 2 to 3 weeks ahead of time for the lowest rate in Miami. And if you’re aiming to cruise past some of the world’s best beaches, head south from Miami to the Florida Keys. Or, if you’re looking for a longer ride, check out Clearwater, one of our Top 10 Road Trip Destinations this summer. 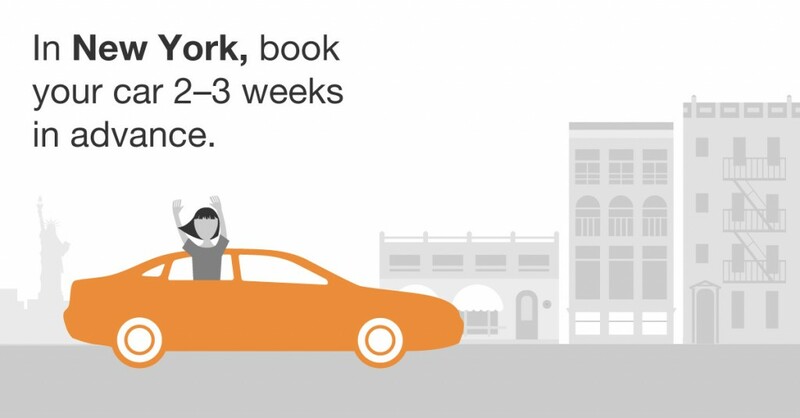 A dip in rental car rates can be seen either 2 or 3 weeks before your trip when leaving from NYC. And as one of our Top Road Trip Origins, New York has a lot to offer – if you’re looking for a scenic day trip, take a drive into the mountains for some lakeside leisure in the Catskills, just 90 minutes from Manhattan. 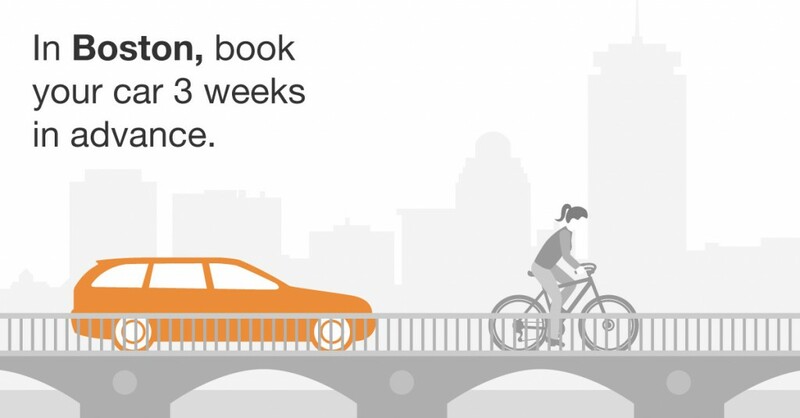 If you’re heading to historic Philadelphia, book your car 3 weeks (or more) before your trip. Atlantic City is just an hour away, and we all know that there’s no better place than the Jersey Shore to soak up some summer rays (and shove down some salt water taffy). San Fran is the perfect place to start your summer road trip – our Summer Travel Hacker Tip suggests taking a cruise up the coast to Mendocino for the best that California has to offer, including beautiful redwoods and fabulous red wine. 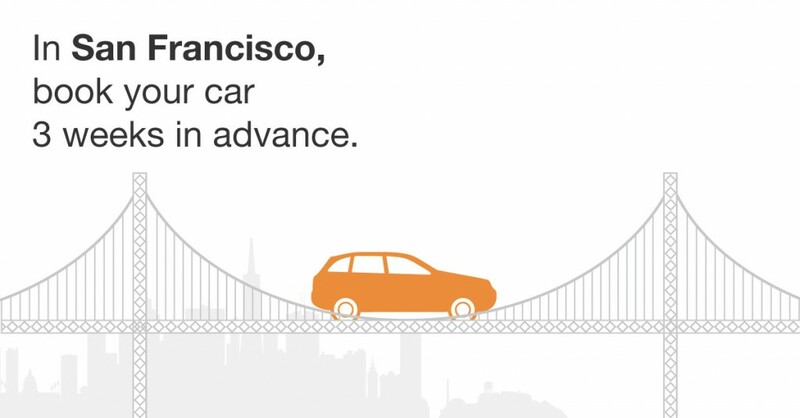 Just be sure to rent a car 3 weeks before you take off for maximum savings. Seattle was also one of our Top Road Trip Origins, so now’s a great time to check out that original Starbucks and then continue the journey up to San Juan Islands to witness the best of whale watching season. Again, your best bet is booking 2 to 3 weeks out. 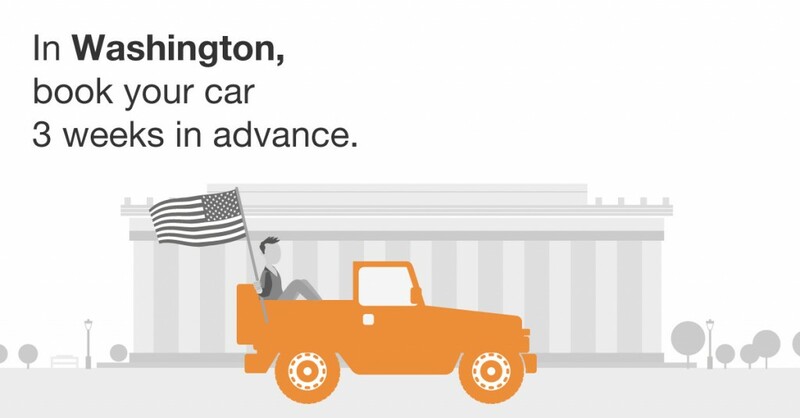 Book at least 3 weeks beforehand if you’re planning on visiting our nation’s capital. And once you’re done with the history, head to Delaware’s Rehoboth Beach for boardwalks, beaches, and some prime nightlife. Who knew the coast was so close? *For searches conducted on the US locale from US origins, the lowest median car rental price based on number of days before departure for travel dates 05/01/2014 and 06/07/2015 and search dates through 06/07/2015.